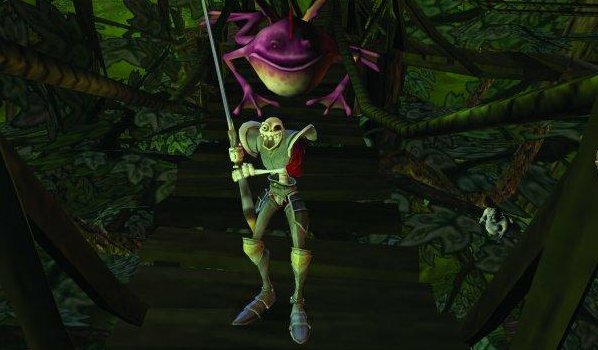 MediEvil 2‘s secret ending was a strange joke that seemingly precluded the possibility of a sequel, and a MediEvil 3 concept was apparently pitched but rejected. But this wasn’t the end for the goofy revenant: Sir Dan skipped the PlayStation 2, but came back on the PlayStation Portable. 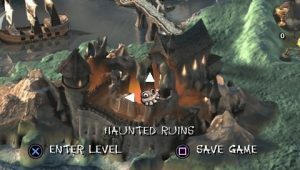 Sony Computer Entertainment Europe asked MediEvil‘s dev team for a game to be used as a launch title for the PSP, but given the very strict time limit (one year), the team decided to work on a remake of the first game rather than to create a new property. To be honest, though, this is not a shot-by-shot remake of the original with better graphics, but more of a “reformulation”, since several levels have been cut, others were merged and some additions more fitting for a portable system were made. 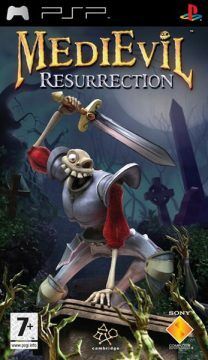 And, while the original was a dark fantasy game with a bit of British humour, Resurrection‘s tone is fully comical, with lots more gags and Zarok being turned from a menacing nemesis to a Saturday morning cartoon villain. Now almost everyone is fully voiced… everyone but Sir Dan, who has reverted to grunts and noises. 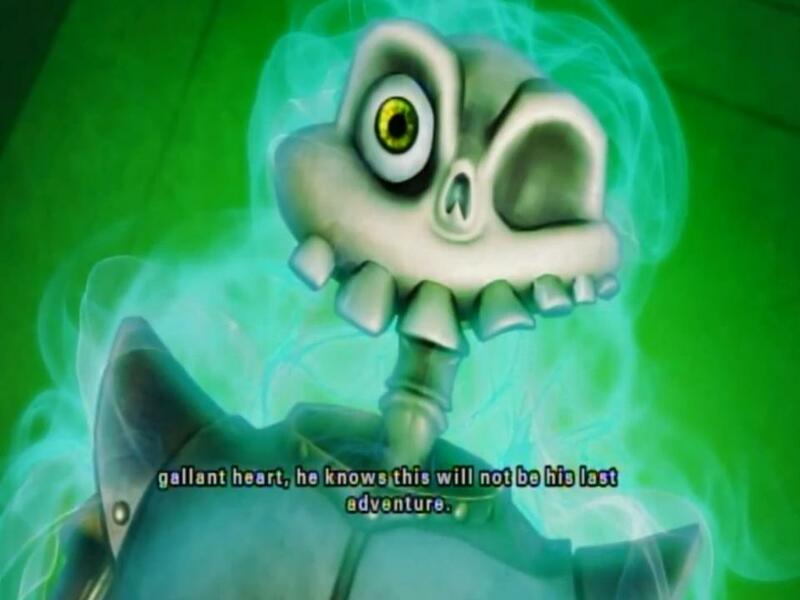 Also, his design has been slightly changed, with the armor baring his midsection, as if it weren’t clear he’s a skeleton. 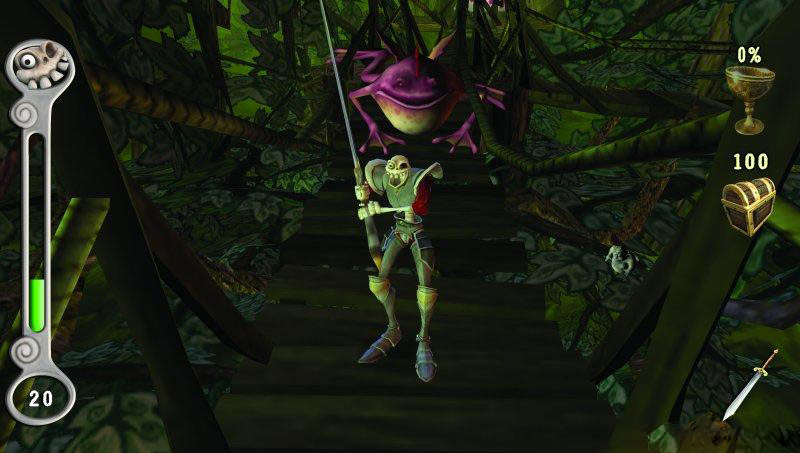 Finally, the developers added an annoying helper character nobody asked for: Al-Zalam, a genie (which looks more like an one-eyed gremlin than anything) who lives in Dan’s empty eye socket. It was meant to replace Morten the worm from the original. It should be noted, however, that original creators Chris Sorrell and Jason Wilson weren’t involved with the project and weren’t too happy with all the changes made to their creation. The only time we get to see Daniel’s human form. The game’s reception was pretty much a mixed bag. 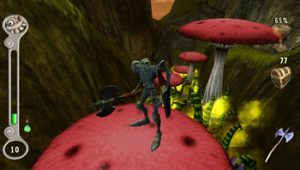 Critics and gamers praised the technical and artistic part, especially the improved graphics with much better polygonal count, textures, lighting and effects. The soundtrack was remade with actual organs and instruments, and the great voice acting, which counts among other performers famed British actor Tom Baker, lends very well to the new comedic attitude of the title. Baker voices the Grim Reaper, who was only a minor character in the original, having appeared in just one level as the ferryman of souls. 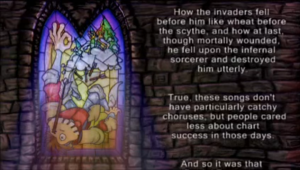 Here, his role has been greatly expanded, up to becoming the narrator for the entire game. On the other hand, Resurrection still suffers from the same problems of the predecessors: a shoddy camera system and a primitive gameplay that hasn’t been updated since 1998. 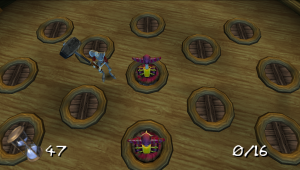 The devs attempted to solve some of the problems by adding a lock-on system for Dan’s attacks, that however doesn’t work very well, especially against bosses or hordes of enemies. Bad collision detection, frequent frame rate drops and cumbersome inputs to switch weapons do the rest. 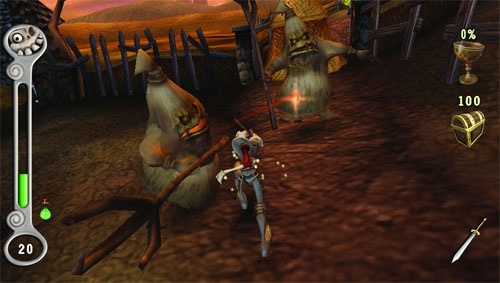 The few additions to the title are a two-player Wi-Fi Mode and several mini-games that can be replayed indefinitely; at the beginning only two are available, but after finding the Gallowmere Plains Carnival more of them can be unlocked. 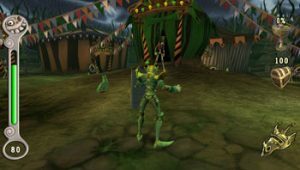 They are the typical carnival stuff such as target practice, whack-a-mole, combat challenges and so on, with three difficulty levels each. 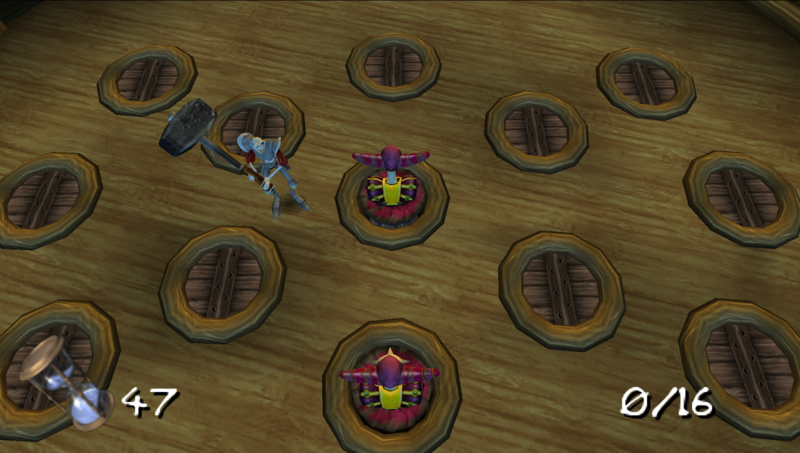 Mastering them will give you a token, and collecting all of these will give Dan the best weapon in the whole game. Mini-games are a nice idea for a portable system that one usually plays in short bursts, but the same can’t be said for the worthless two-player experience. Basically, you are running against a friend through the levels, but you don’t ever see the opponent, only a dot on an indicator, making it just a boring race against the clock. 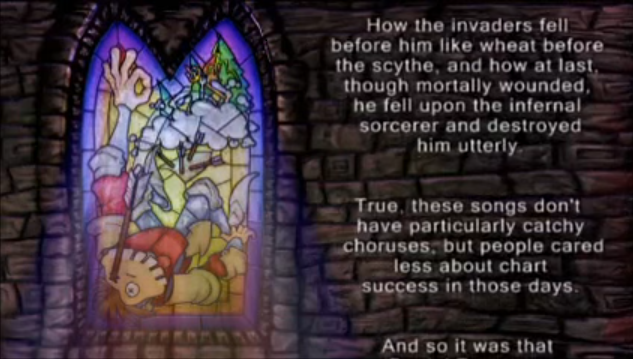 The game managed to sell well (more than one million copies sold), but only the most rabid Fortesque fans were completely happy with Sir Dan’s return: the game didn’t really improve on the original and PSP owners soon found better action titles, and the humor alone couldn’t really justify the purchase, especially since watching long monologues and cutscenes on a portable system is not the same thing as doing it on your TV screen in the comfort of your home. Still, our British zombie hero managed to come back from the dead a couple times more. A little bit of trivia: PSP futuristic racing game Wipeout Pure, that came out the same year as Resurrection, contains a cross-promotion for the latter in the form of an unlockable ship named “Medievil” (without capital “E”) which is very fast and maneuverable but has poor shields. Studio Cambridge’s next major project after MediEvil was Primal (2003), a similar dark fantasy story but more serious and epic in tone and scope. 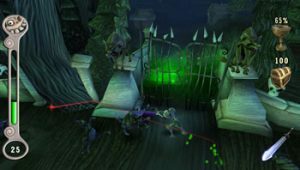 Still, the devs managed to sneak in a couple of references to their undead hero: during the initial cutscene a model of a Dan-Hand can be barely seen among several other items on a table, also while traveling through a cemetery a crypt labeled “Fortesque” can be found. 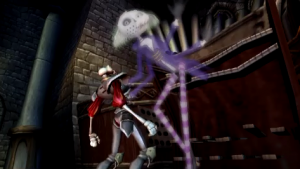 The studio also put another oblique reference to Sir Dan in their next title Ghosthunter (2003), in the form of Freddy Fortesque, a ghostly army colonel with an eyepatch who is implied to be the last descendant of Dan’s family. 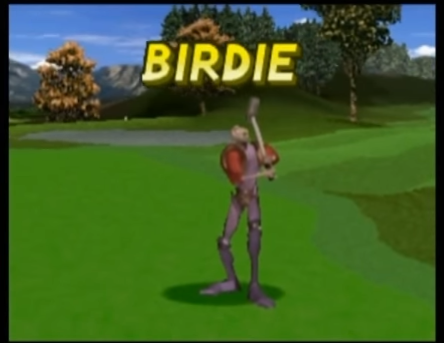 Before that, however, Sir Dan had a much more substantial cameo, as an unlockable player character included in the US and European versions of Minna no Golf 2/Everybody’s Golf 2 (2000) Joining him as bonus characters were other mascots popular at the time: psychotic clown Marcus Kane AKA Sweet Tooth from the Twisted Metal series and wisecracking gecko Gex. 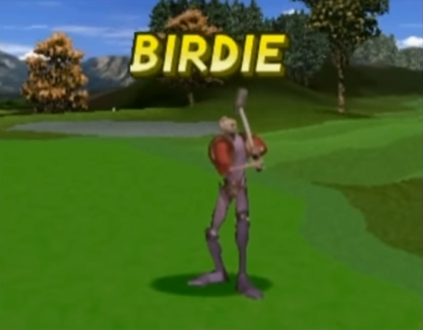 Quite bizarre choices for a mostly realistic golf game! Daniel unsurprisingly has high power but low accuracy stats. 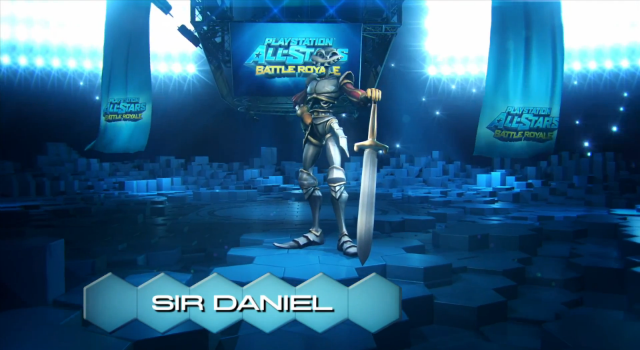 Sir Dan’s consecration however happened several years later on the PS3, when the mumbling cadaver was included among the popular characters featured in the roster of PlayStation All-Stars Battle Royale (2012), Sony’s equivalent to Nintendo’s Super Smash Bros franchise. 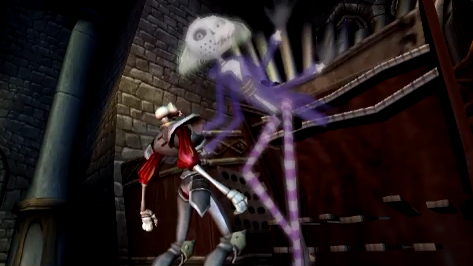 A European armored zombie feels a bit like the “odd man out” in a selection that features mostly American and Japanese characters that are either cutesy mascot characters, like Parappa the Rapper and Ape Escape‘s Spike, or angry edgy dudes, like Kratos or Evil Cole McGrath, and this goes on to demonstrate the franchise’s enduring popularity. As a fighter, Fortesque is a balanced character with several melee attacks both in the quick category and the area-of-effect category, and also a bit of ranged combat with the boomerang axe and crossbow. Dan’s appearance (as well as the comedic narration of his Arcade Mode) is mostly taken from his Resurrection redesign, with elements coming from all three games in his series. For example, he can wear the Dragon Armor from the first game or the golden armor that is the ultimate power-up of MediEvil 2, and his Level 3 super move takes advantage of the Anubis Stone, an artifact introduced in the PSP game. His personal stage is the Gallowmere Graveyard, presented with Resurrection‘s new coat of paint. 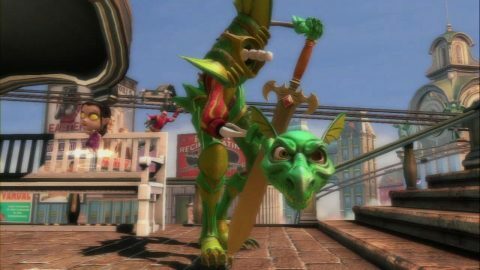 It was released as the last piece of DLC, and comes with zombie-releasing coffins and a gargoyle that proceeds to mock several other fighters. The stage also crosses over with the PS3 adventure title The Unfinished Swan. 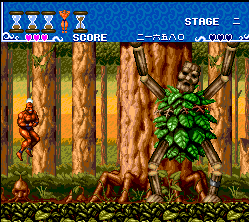 The strangest tie-in to the series however is not a game, but a song performed by now-defunct Finnish power metal band Sinergy. Titled “Gallowmere”, it is included in their 2000 album “To Hell and Back”, and sung from the point of view of villain Zarok, who laments being defeated and usurped by Sir Daniel. Will Daniel be awakened again in the future?